An irresistible treat for Parakeets, Canaries & Finches! 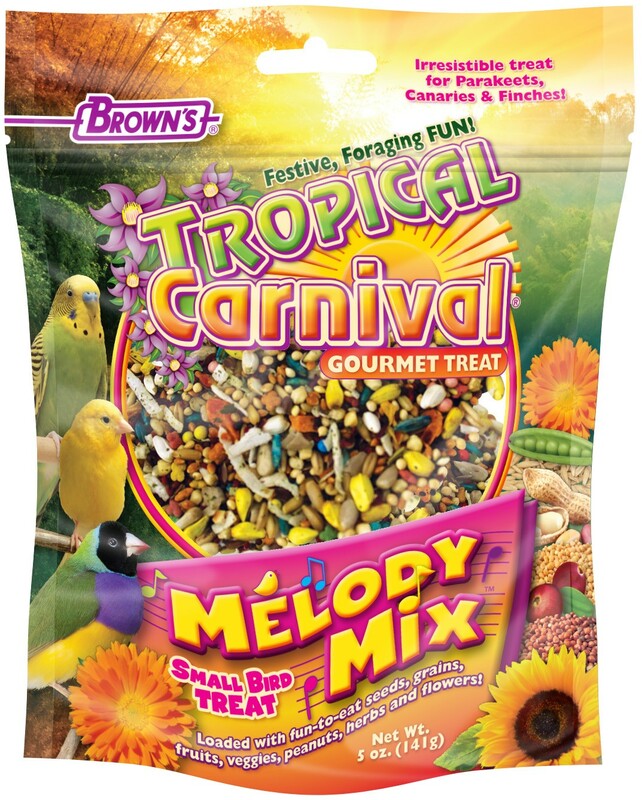 Tropical Carnival® Melody Mix™ Small Bird Treat is formulated for parakeets, canaries, and finches. 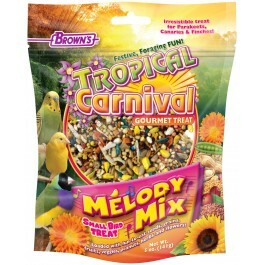 It's loaded with a variety of right-sized, fun-to-eat goodies that will make your bird sing a happy tune! 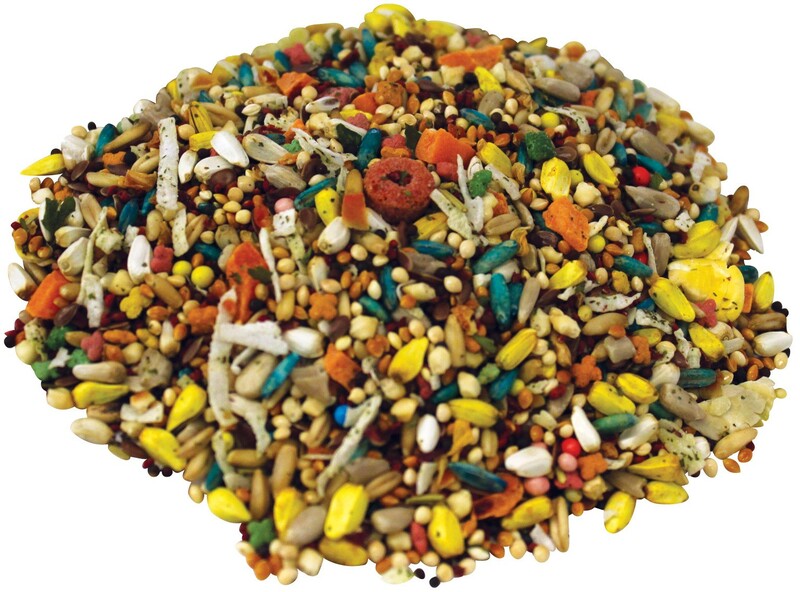 It's jam-packed with wholesome seeds, grains, fruits, veggies, peanuts, herbs, and marigold flowers bursting with flavors and textures your bird will love to eat. This special foraging blend helps relieve the cage boredom of your pet. It's simply irresistible! White Proso Millet, Oat Groats, Red Millet, Safflower Seeds, Sunflower Hearts & Chips (Dehulled Sunflower Seeds), Flaxseed, Canola Seed, Dried Cranberry Seed, Dried Papaya, Peanuts, Flaked Corn, Flaked Peas, Dried Carrots, Dried Coconut, Dried Ground Apple, Dried Ground Apricot, Dried Ground Carrot, Dried Ground Cherry, Dehydrated Ground Sweet Potato, Dried Coriander, Dried Parsley, Dried Rosemary, Dried Savory, Dried Marigold, Wheat Flour, Ground Corn, Ground Oats, Corn Gluten Meal, Dehulled Soybean Meal, Rice Flour, Potato Starch, Soybean Oil (preserved with Mixed Tocopherols), Dicalcium Phosphate, Brewers Dried Yeast, Calcium Carbonate, Fat Product (Source of DHA), Fructooligosaccharide, L-Lysine, Salt, Vitamin A Supplement, Vitamin D3 Supplement, Vitamin E Supplement, L-Ascorbyl-2-Polyphosphate (Source of Vitamin C), Thiamine Mononitrate, d-Calcium Pantothenate, Vitamin B12 Supplement, Choline Chloride, Manganese Proteinate, Iron Proteinate, DL-Methionine, Zinc Proteinate, Sodium Selenite, Dried Pediococcus acidilacticii Fermentation Product, Biotin, Folic Acid, Lecithin, Mixed Tocopherols (a preservative), Citric Acid (a preservative),Yucca Schidigera Extract, Rosemary Extract, Beta-Carotene, Natural and Artificial Orange Flavor, Colors Added (Titanium Dioxide, Red 40, Blue 1, Yellow 5 and Yellow 6, Turmeric, Paprika, Carmine), Sugar, Carnauba Wax, Confectioner’s Glaze Shellac, Dextrans, Natural and Artificial Vanilla Flavor, Sulfur Dioxide (a preservative).